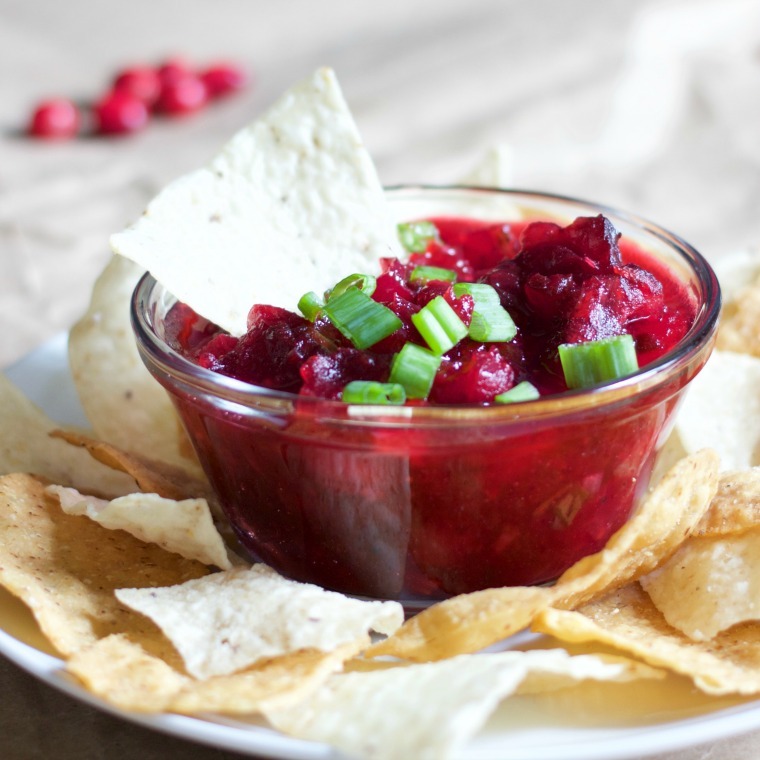 This spicy sweet cranberry salsa will have you licking the bowl whether you’re watching a game or partying with your family and friends. 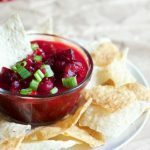 Five or six years ago, our next-door neighbors showed up to a holiday get together with this amazing cranberry salsa, and it’s been a staple appetizer at my mom’s house ever since! It is always a hit, and is a creative way to get in your cranberries this holiday that doesn’t involve jiggly stuff from a can. The original recipe is an Ocean Spray recipe, but I made a substitution for palm sugar instead of white sugar, and also added more green onion, jalapeno and a little salt and pepper. I had bought palm sugar on a fluke one time because it was on sale at Sprouts. I used it to make a bunch of blueberry muffins this fall, but then forgot about it in the back of my cabinet. Palm sugar is a little less sweet, and a little more “earthy,” I’d say. It is perfect for this recipe because you’re incorporating savory flavors, and it helps to lower the sweetness level. However, if you don’t have palm sugar laying around, good old white sugar will do just fine. I love the combination of green onions and sweet things. 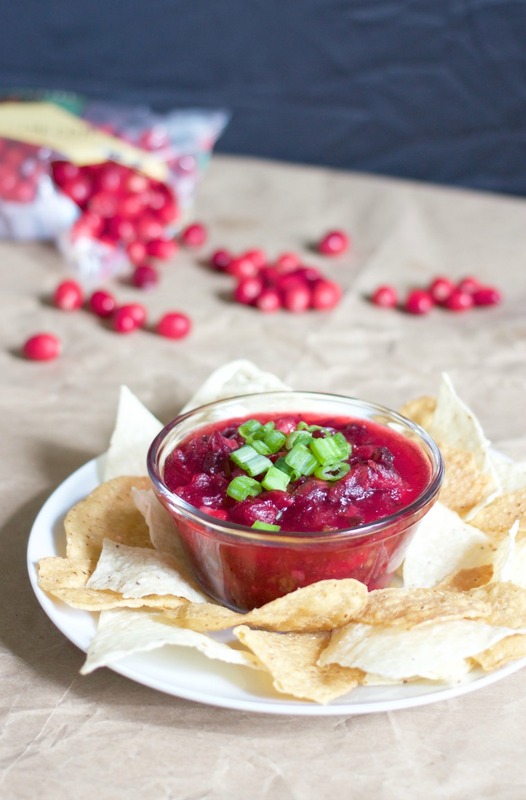 I think they go well together often – this cranberry salsa is no exception! I added more green onions so their punch could really come though in this dip. 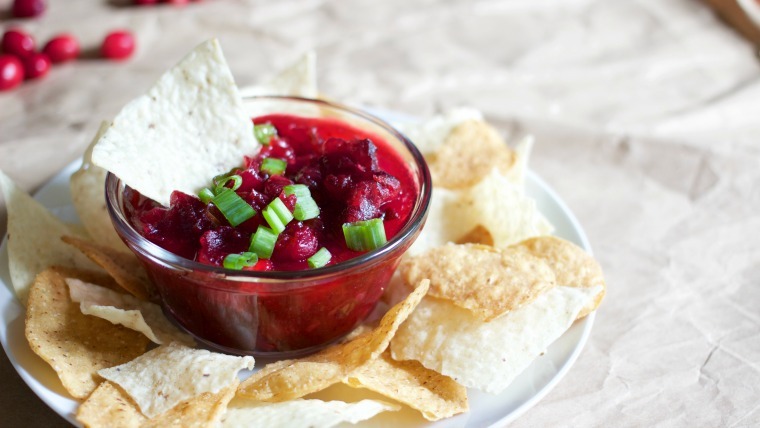 You can serve this cranberry salsa right alongside the other salsas – it plays nice with tortilla chips! Bring it to a bowl-watching party, or just eat it in your pajamas while you’re watching Christmas Day basketball (that will be me). It can also be served as a chutney on a cheese plate or even as a jam on top of a cream cheese block. The possibilities are truly endless. Local Spotlight: Green onions are one of the last greens I can still find at the farmers market! Get ’em before they’re gone! Finely dice jalapeños and green onions. Dissolve palm sugar in water on medium low heat. Bring to a boil. Add in cranberries, and let simmer for 10-15 minutes, without stirring. Remove sauce from heat, and stir in jalapeños, onions, salt, lime juice and cumin. Serve with tortilla chips, crackers, over cream cheese or eat it with a spoon! Hi! Just to give you a heads up, when I try to share this recipe via Facebook, it comes up with a “page not found” error, even though the link works. You might check your WP code or something. Thanks! That happened on accident, it’s been fixed now!